Solve the Mystery At Hogwarts by playing this fun board game based on the hit Harry Potter movies. Harry Potter Mystery at Hogwarts is a fun twist on the classic board game of Clue. You'll need to find out where, who, what spell was used, and who the victim was. Harry Potter Mystery at Hogwarts brings to life the exciting elements of the Harry Potter movies and lets you pretend that you're actually there. Harry Potter Mystery at Hogwarts will give you and your opponents a chance to explore and roam. Watch out for ghosts and goblins along your way. Harry Potter Mystery At Hogwarts will have all Harry Potter lovers seeking out this fun new game. Love Harry Potter? Make sure you check out this exciting game. To be the master of Harry Potter Mystery At Hogwarts you must be the first to solve the mystery at Hogwarts. But be careful where you point your finger, a wrong guess will cost you the game. 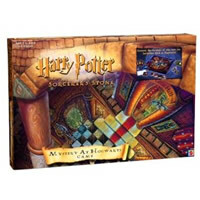 Harry Potter Mystery at Hogwarts should come with game board, 10 green Hogwarts cards, Hogwarts dice, 23 blue hint cards, 6 hat movers, Hunch checklist pad, the Ghost(translucent blue figure), and the Harry Potter Mystery At Hogwarts rules and instructions booklet. Please keep in mind that the official Harry Potter Mystery At Hogwarts board game rules and instructions could be different depending on the game version you have. The rules below are some of the exact directions on how to play Harry Potter Mystery At Hogwarts. Share with us your comments, funny stories, tips, advice, strategies, creative ways to play, questions about how to play, problems with the rules or anything you want about Harry Potter Mystery At Hogwarts. All submissions will be reviewed within 24 hours. Click here to add your Harry Potter Mystery At Hogwarts comments.